Well, for those who don’t know the work of Tony Mitchell, he played bass guitar and sang for acts like Alice Cooper, Jon Anderson and ALAN PARSONS PROJECT. But what could we expect from “Beggar’s Gold”, his new album? Well, let’s start! 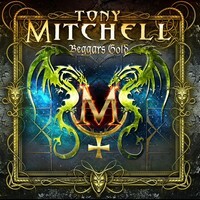 Tony’s work on this album is a midterm between AOR from the 80’s with North American Arena/Hard Rock from the 70's/80's. Today you can call it a mix between Melodic Rock/Glam with a Classic Rock insight. It means that you’ll have an elegant and charming set of songs, with fine and accessible melodic lines, amazing choruses and aesthetically it bears a clear Pop Rock scent. For the ones who looks solely for extreme Metal genres, you must stay away from this album, but if you’re just a fan of music that can’t stand labels, go on and hear it out loud. Recorded at XGypsy Studios, Tony himself produced and mixed the album, having the mastering of Chris Clancy. And his experience earned him enough knowledge to make the sound quality of “Beggar’s Gold” something great, because it sounds loud and clean, with the right instrumental tunes to be an accessible Rock album. Yes, you’ll hear all the musical instruments and arrangements without problems. These 13 songs are all a very good experience to be heard, so “Beggar’s Gold” is that kind of album that you can let it play from the first track to the last one without concerns. But the astonishing melodies and chorus of “Playing With Fire”, the charming accessibility presented on “Never Say Die” and “What You Make It” (both with fine guitars parts), the beautiful and elegant “Stone by Stone” (great presence of a chorus here), the Country/Pop scent of the modern “Wildside”, the excellent melodies of “Beggar’s Gold”, and the bittersweet “Welcome to the Revolution” are ones you can hear first. It’s a very good album, indeed.